While on the surface it might look like just another cryptocurrency screener, CoinGecko gives some unique metrics you won’t find anywhere else. 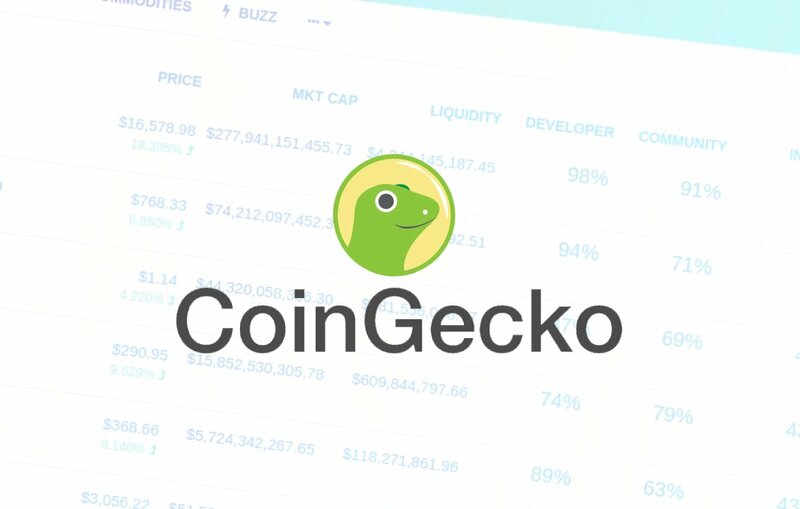 Created in 2014 by two university graduates, CoinGecko is a cryptocurrency screener with a difference. By collecting data from unconventional sources (code activity, social followings and search popularity), CoinGecko’s stats let you easily benchmark and compare cryptocurrencies based on popularity metrics – so you can quickly assess the following, activity and demand. With this data, they’ve come up with the following helpful metrics, which they provide as a percentage, meaning it’s easy to compare between currencies. ﻿How actively-developed the code is. More active is a sign that the currency continues to innovate, fix issues and stay ahead. How popular the site is and how many search results there are. This indicates the site is being written about and searched for. 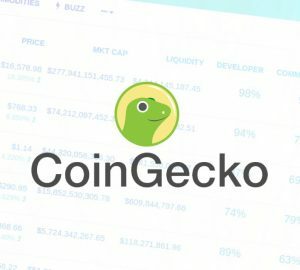 You can read more about CoinGecko’s methodology on their site. CoinGecko save you from going to the effort of finding the number of social followers and discussions for each cryptocurrency, along with code activity, number of search results and Alexa rank (website popularity). This really can’t be understated. CoinGecko give you one single place where all these figures have already been crunched – so you can just work with the end results – and quickly find coins which you can add to your shortlist﻿. Subscribe to their newsletter if you want immediate access. The CoinGecko team have recently added embedded cryptocurrency widgets for your website. You can easily generate your widgets on their site. This has to be our favourite tool for quickly assessing how popular a cryptocurrency may be – and how actively-developed the code is. What more could you want from a cryptocurrency screener? 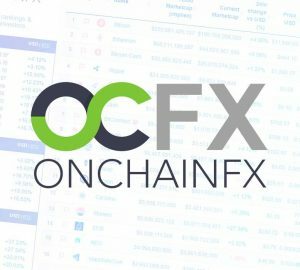 If you use CoinGecko in conjunction with OnChainFX, you’ll have a pretty good idea of whether a specific cryptocurrency is right for you. It saves time and it saves effort. By keeping results simple — as percentages, you can quickly compare cryptocurrencies on a familiar scale – so it’s easy for anyone to pick up and understand. CoinGecko have accomplished a mammoth task: harvesting statistics for each cryptocurrency. Take for example indexing social media activity for each cryptocurrency. Not all currencies use the same social networks, and some networks won’t let you automate data collection in the way CoinGecko might need. So CoinGecko’s statistics are only as good as the available data. It’d be good to see how CoinGecko calculate these metrics. While it’s great that there’s a % listed for each metric, it’s not entirely clear how these have been calculated. 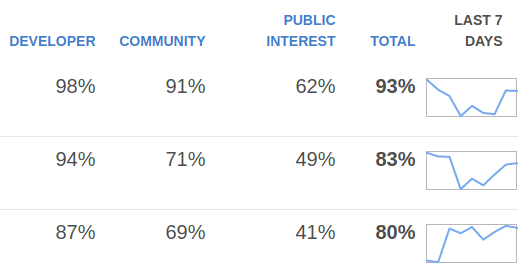 Take the total % for instance: it’s not clear what percentage of this is made up of the Community ranking and which percentage is made up of the market cap. We just don’t know. The methodology page is certainly useful, but it’s not known how overall percentages are weighed on the index — something we’d love to know more about. But don’t let this put you off. 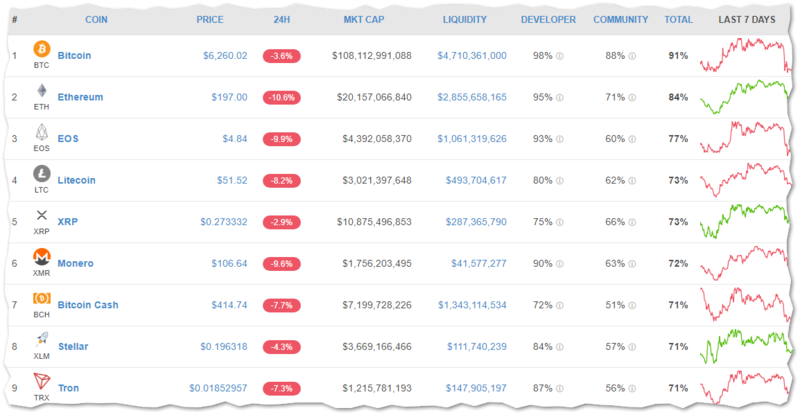 CoinGecko is one of the most useful tools out there, one we use on a weekly basis. We recommend it as one of the best tools for screening and comparing cryptocurrencies.